Big Data creates petabytes of data that organizations can readily mine to discover patterns and trends. Although Hadoop provides a comparatively inexpensive way to manage massive amounts of data, it is difficult to manage as the Hadoop cluster grows big. EMC Isilon scale-out network-attached storage (NAS) has integrated support for Hadoop analytics. Isilon is the only scale-out NAS platform natively integrated with the Hadoop Distributed File System (HDFS). Using HDFS as an over-the-wire protocol, organizations can deploy a powerful, efficient, and flexible Big Data storage and analytics ecosystem. RainStor unique enterprise database with its data compression and security enables organizations to query information via a MapReduce or SQL interface. RainStor allows data to be efficiently stored using extreme data compression instead of archiving massive amounts of data and then reloading it whenever as needed by the Big Data applications. There by enabling organizations efficiently to run analytics on Hadoop on larger datasets and reducing the infrastructure costs. 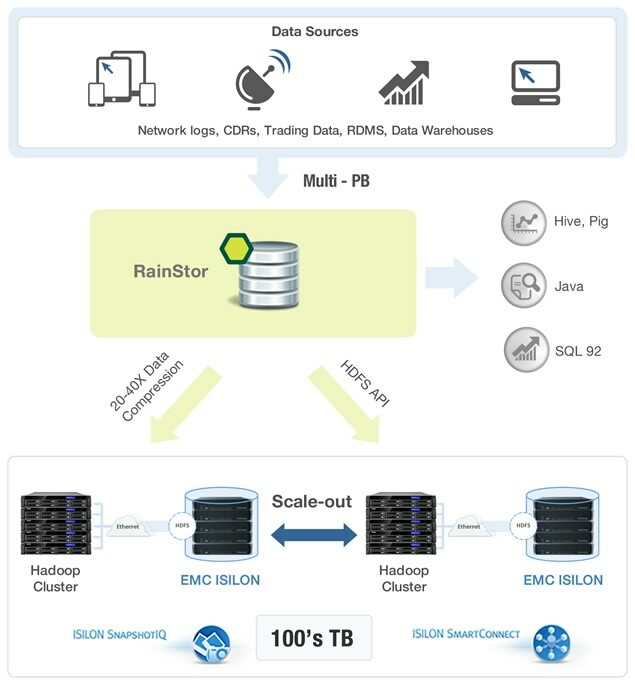 When RainStor deployed alongside with EMC Isilon scale-out NAS, it provides an efficient way to keep massive amounts of data active without having to invest in additional infrastructure as the amount of data in the Hadoop cluster grows. Using Isilon, the compute and storage for Hadoop workload is decoupled, enabling organizations to balance CPU and storage capacity optimally as data volumes and number of queries grow. RainStor – EMC Isilon solution could be used to archive huge amounts of structured data or as a tape archiving for compliance requirements. The data could be accessed via Hive, Pig, MapReduce, or SQL. It also provides the industry-leading storage efficiency with zero data replication, 20-40X data compression, and >80% NAS utilization rate. There is increase in I/O bandwidth due to RainStor compression and the scalability is ensured by adding compute or storage separately as required. This solution also comes up with multi-protocol support such as HDFS, NFS, FTP, and HTTP. For more details, download RainStor for EMC Isilon Solution Brief. This entry was posted in Hadoop and tagged Hadoop, Isilon, RainStor. Bookmark the permalink.